The Adelaide MBA has moved up one place in the BOSS rankings to the number 5 spot, confirming its position as a leading Australian MBA program and the very best offered in the State. “Our latest BOSS magazine ranking is welcome news, especially considering the incredibly strong competition among MBA programs nationally,” says Adelaide MBA Director Damian Scanlon. “This is an endorsement from companies and MBA graduates alike – the voice of working professionals – showing that Adelaide’s MBA is right among the very best. “A major component of the BOSS rankings is based on feedback from independent alumni surveys, meaning our graduate satisfaction is high and our program has made a significant contribution to the career outcomes of our graduates,” Mr Scanlon says. 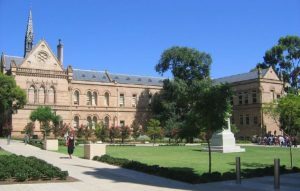 The University of Adelaide’s MBA is one of very few in Australia with 100% teaching staff having extensive and current business involvement, making each course applied and practical. The University maintains stringent entry requirements, which ensures Adelaide MBA students are of a high calibre with significant work experience. As a result, students leverage the experiences from a talented peer group which works to build an intimate and engaging learning experience. The BOSS rankings included an assessment of the curriculum, meaning the standard of coursework and learning outcomes are considered to be of an exceptional quality. “For each of our students, the Adelaide MBA is a contemporary, rich, and transforming personal and executive leadership journey,” Mr Scanlon says. “We recognise that this journey is about introducing new skills and strengthening the many skills our students already have, sharing those skills with their colleagues, and having the chance to interact with their peers and to develop lifelong networks. “It is essential for current and future managers and leaders to be equipped to deal with complex problems in a systemic, integrated and collaborative fashion. We are in a world that at times is volatile, unexpected, complex and ambiguous. Therefore, the Adelaide MBA program focuses on delivering what’s needed, what’s demanded, and we expect it to be the highest quality educational experience, equipping our graduates to embrace this increasingly complex world with both hands,” he says.